Below is a list of resources provided by the Hudson Estuary Watershed Resilience Project team, project partners, and other organizations that pertain to landowners and residents. When flooding hits close to home… Who can you call?How do I prevent erosion and stabilize the stream bank? What do I do when my property has been damaged by flooding? Do I need a permit? 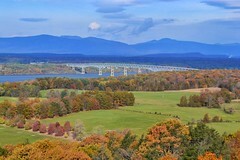 The handouts below guide landowners in answering these questions, and include technical and regulatory contacts that can help in each target region of the Mid-Hudson Valley. and communication preferences of streamside landowners in the study area. This is a guide for municipal officials, highway supervisors and contractors to help them address the flooding of streams and creeks that affects bridges, roadways and other public infrastructure. It includes an overview of flooding concepts and terminology, outlines flood-smart strategies and how to prepare for a storm, explains what to do during and after a storm, provides information about a number of technical and funding resources and contact information for local, state, and federal agencies that can help. This 2-page document provides information and resources for the Village of Catskill (Greene County) regarding flood preparedness, emergency contact and location information, and information on what to do after the flood has subsided. Look for versions of this guide for other Hudson Valley communities in the future! This brochure is a short & sweet resource highlighting the benefits of dam removal in the Hudson Valley. It discusses in brief the current state of dams in the region, the financial, infrastructural, ecological, and safety benefits of removing aquatic barriers in our watershed, and provides a short list of options and resources for dam removal. David Strayer of the Cary Institute for Ecosystem Studies in partnership with the Hudson River National Estuarine Research Reserve’s Sustainable Shorelines Project has released a new handbook for Hudson Valley municipal officials and residents, entitled “Managing Shore Zones for Ecological Benefits”. The purpose of this handbook is to offer suggestions for practical ways that landowners and land managers can protect shore zones and increase the benefits that they provide. 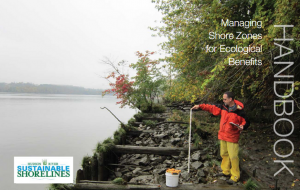 Although targeted at the Hudson River, many of these suggestions will be helpful for managing shore zones along lakes, rivers, and estuaries elsewhere. Click here for a digital copy of the handbook! Life at the Water’s Edge – Cuyahoga River Remedial Action Plan, Cuyahoga Soil & Water Conservation District, Summit Soil & Water Conservation District, Northeast Ohio Areawide Coordinating Agency – A colorful and informative guide about living in harmony with your backyard streams (new edition available soon). Have you noticed that trees are budding earlier in the spring, that summer heat waves are more common than they used to be, or that when it rains, it pours? What you are witnessing is part of a global change in the Earth’s climate. Scientists once thought climate change would take many generations to be felt, but instead we are already experiencing its dramatic effects. Historically, the Earth’s climate has fluctuated, but natural factors alone cannot explain today’s rapid pace of change. There is overwhelming evidence that an increase in gases like carbon dioxide (CO2) in the atmosphere is causing this transformation. The Earth is warming and New York is too. Just as we are seeing unprecedented rates of change at the global level, we are also observing rapid change in New York, including rising temperatures and changing precipitation patterns, with effects on the natural world and human health. Intense rains and floods, summer droughts, and heat waves are more common than they were in our grandparents’ time. New York’s climate will continue to change over the next 10, 20, and 100 years as detailed below. Stand by Your Stream: Why Bother? You own a creek, perhaps by accident, perhaps because you love to fish or want to have fun with your kids. The truth is, you own much more. The adjacent streamside is not only an integral part of the stream but a unique habitat in itself. Most streamsides, or riparian zones, have historically been cleared for agriculture, reinforced for railways, cleared for development, and only occasionally been left alone. They have been viewed as barriers preventing access to the greater excitement of the stream. Yet, an intact and healthy streamside habitat serves many critically important functions. It deserves protection and good management. Streamside habitats are integrally connected to the health and ecology of fish and other organisms within the stream and to many terrestrial species as well. Streamsides also help improve water quality. Protection of the streamside habitat is critical. Proper management, however, depends not only on maintaining the integrity of the streamside but also on controlling activities in the watershed surrounding it. These management issues can be considered under four broad categories. Teamwork and careful planning are two key ingredients for the successful restoration of a streamside. Both elements are critical to avoid wasting money and considerable effort, and to reduce the chance of future problems. The following summary provides an overview of the steps needed to restore your streamside successfully.